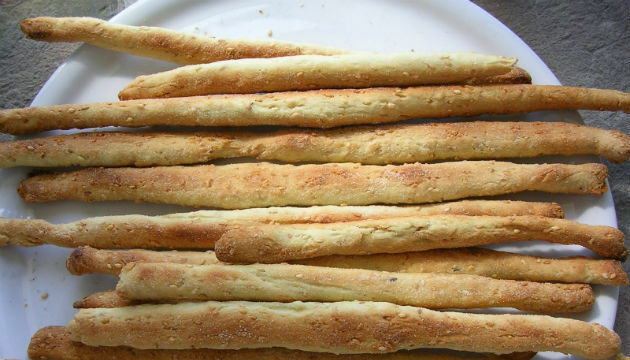 These “bread” sticks are a nice alternative to regular high carb/high calorie bread sticks and they are also gluten free! Serve them with a soup or as an appetizer. Try adding sesame seeds or poppy seeds as well. They are low carb at only 3g net carbs and 4 Weight Watchers points. In the bowl of a food processor, combine almond flour, coconut flour, arrowroot starch, xanthan gum, garlic powder and salt. Pulse a few times to combine. Sprinkle butter over almond flour mixture and pulse until it resembles fine crumbs. With processor running on low, add water through feeding tube 1 tablespoon at a time until dough clumps together. Form into a flat disc and cover with plastic wrap. Chill 30 minutes. Preheat oven to 300F and line a large baking sheet with parchment paper. Take about 1 tablespoon of dough and roll it between your palms into a cigar shape. Continue to roll gently on a piece of parchment or a silicon baking mat into a long thin stick, less than half an inch thick and 7 or 8 inches long (if it breaks at any point, you can easily press it back together). Sprinkle with a few teaspoons of grated cheddar, gently pressing the cheese into the stick to adhere. Transfer to prepared baking sheet. Repeat with remaining dough and cheese. Bake 25 to 30 minutes, until firm and cheese is lightly browned. Remove from oven and let cool completely to allow them to get crispy as they cool.